Hei, pyrypäivällä arkeen! Olihan hieno pääsiäinen, posket paloivat auringossa ja tulipa hiihdettyäkin jäällä. Wau, kortti pienelle iloiselle tanhupallotytölle, näitä on muutama nyt varastossa. Sisustuskahvila Wanha Justiina, Karjalankatu 3 Lahti. Hi, we had a fabulous sunny Easter wheather - until today, it has snowed all day. Yesterday I burned my cheeks on the sun while skiing on the icy lake. 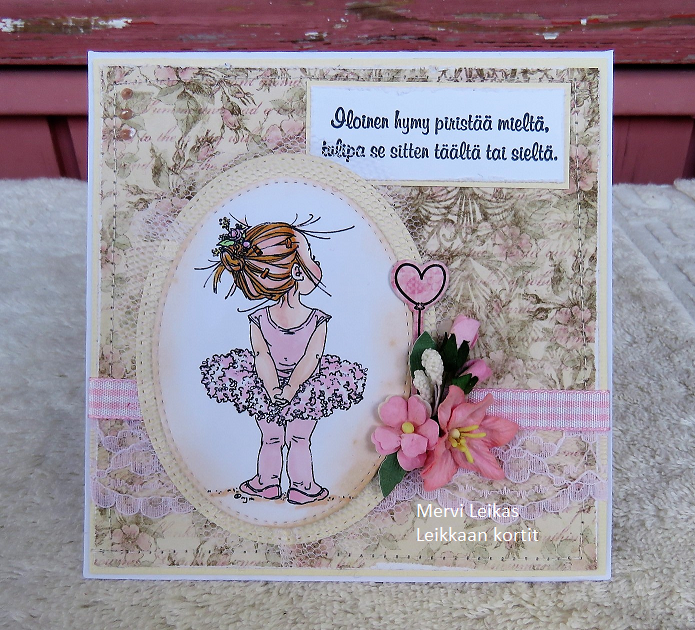 These little ballerina cards has nothing to do with the text above. I just post it now, because my new retailer showed it on her pages. Another card with brighter colours and butterflies, papers are Penny Black's. Oh, they are just darling! I like how you’ve added some texture too. The first one is delicate, the second is fresh and summery. Sorry I’ve been absent for a while, mojo lost and a week of holiday in the sun with my mum, then lots of tv time during Easter. In Norway it’s tradition that the channels are showing lots of crime series with several episodes in a row over several nights. Two beautiful cards with lovely embellishments and a sweet image. Thank you for your lovely comment on my GDT PBM. DARLING cards, Mervi! I prefer the first one a bit more because of that sweet gingham ribbon and the tiny flowers. Thank you for playing with us once again at the Simon Says Stamp Wednesday challenge! Voi miten herttaisia! Ensimmäinen on ihanan hempeä ja toinen kivan raikas. Such a pretty image used on two lovely cards. Thanks for sharing over at LPCF this month. Love how different these are! The background paper and the flower spray on the first are so pretty. The vibrant colors on the second are so cheerful.